Last year we ran a campaign around the Government of Sri Lanka’s seizure of land belonging to Tamil families forced from their homes by the civil war. Over 7,000 acres of land – potentially up to $2 billion worth at current prices – was seized in the Northern and Eastern provinces using land acquisition notices which gave little justification for the seizures. The vast majority of this land, 6,381 acres of it, is contained within the Valikamam High Security Zone in the northern Jaffna peninsula.Over 2,000 displaced people complained through the Sri Lankan courts but their cases are yet to be heard. They continue to be denied access to their land – indeed no one can enter the ring of checkpoints surrounding the zone without the army’s permission. Meanwhile, research continued to cast doubt on the validity of the Sri Lankan Government’s seizure. In particular, while the Government claims it needed the land for a “public purpose” all the evidence appeared to point to the land being put to commercial use. The Government openly touted a hotel they opened on the land, while local reports suggested that a yogurt factory had been built and that the abandoned cement factory was to be brought back into use. All of these ventures, built on judicially stolen land, were to be run by and for the army. Questions were also asked as to what possible public purpose could require such a large amount of land. Even with the Sri Lankan Government’s incredibly high level of militarisation in the north of the country it seemed inconceivable that they would need a base of this size. Many thousands of Tamil families were seemingly being kept from their homes just so the Sri Lankan Army could have a few extra thousand acres to play with. 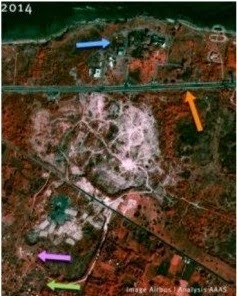 It was for this reason that we asked the Geospatial Technologies and Human Rights Project of the American Association for the Advancement of Science to acquire and analyse high resolution satellite images of the Valikamam High Security Zone to determine precisely what use the land was being put to. You can access their report here and the map below summarises their main findings. The analysis found that that the majority of the land does not seem to be used for public facilities, with much of it devoted to farming or commercial use. They generously estimated that 7.77 square kilometres (around 30% of the total 25.8 square kilometre site) was being put to “institutional use” and therefore could potentially have some sort of public purpose. The remaining area, covering 18 square kilometres and the former homes of thousands of displaced people, would thus appear to have simply been stolen for private gain. Around 2,150 new buildings were built across 6.5 square kilometres in the western portion of the zone up to and obscuring the zone’s border. These buildings were seemingly small houses (with an average size of around 35-81 square meters) and don’t seem to be part of a military base. New buildings associated with the Thalsevana holiday resort are visible, as are a number of developments around the site. Three other new developments, seemingly commercial (or at least non-institutional), are visible. They are pictured below. One appears to be associated with the redevelopment of the Keerimalai temple, while the other two – one in a quarry – are of unknown purpose. Many of the original houses in the High Security Zone have fallen into disrepair or been reclaimed by the vegetation. However, due to the significant number of new buildings being built in the western part of the zone, the total number of buildings has gone up from 3,200 to around 4,700 – the vast majority of them (76%) seemingly non-institutional in nature. The evidence would also seem to suggest that the Sri Lankan army’s troops are far more geographically dispersed across the Northern Province than the Sri Lankan Government have been leading the wider world to believe. Contrary to the line that troops are increasingly being moved out of the civilian areas and consolidated into the HSZ, the images are consistent with evidence elsewhere that the army continues to have a pervasive presence in civilian life in the north. 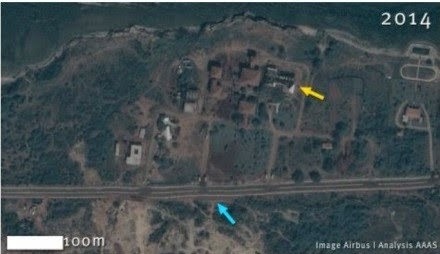 Even if we take the government’s claim that there are only 13,200 soldiers in the Northern Province at face value – and civil society sources have pointed out that the figure is in reality probably far higher – the images appear to show that there is simply not the housing capacity within the HSZ to accommodate this number, thereby corroborating previous arguments that a base of this size cannot be justified. Although 374 new institutional buildings have been constructed, 310 have been destroyed. And while most of the buildings built have been larger than the ones they have replaced, very few look like barracks or indeed residential buildings of any sort. With a total number of buildings in institutional areas of 1137 it appears the total residential capacity of the Valikamam High Security Zone as a military base is in the low thousands at most. Even if we were to take the generous position of assuming that every structure within the High Security Zone is used to house soldiers there are only 4,700 buildings in total and most are small houses of between 30 and 80 square meters. It seems unlikely that the total residential capacity of the area is close to 10,000 – let alone in excess of it. It would therefore appear that the Sri Lankan Army has at least several thousand troops, and in all probability tens of thousands of troops, deployed in the Northern Province but based outside of the HSZ. Indeed it would appear that much of the Sri Lankan Army’s military presence in the Northern Province is based outside of the HSZ. This would explain why the Sri Lankan Army has been simultaneously attempting to formalise its occupation of 18 other plots of land within the Northern Province. This geographic spread suggests a desire for the Sri Lankan Army’s militarisation of the Northern Province to be visible to the local population, and not hidden away within the High Security Zone. 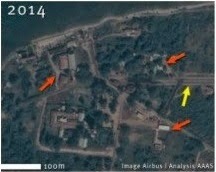 It suggests that the Army is still keen to ensure that it’s military are an obvious and active presence within the day to day life of Sri Lanka’s northern Tamils across the Northern Province – a form of military occupation which, combined as it is with systemic human rights abuses, we believe constitutes an ongoing crime against humanity. If you think you might be affected by any of these land seizures, or if you have any more precise information about the location of the land, photographs of the land, or who might own it then please get in touch.